Are you in food service, retail, buying direct or seeking export? Definition: award winning caramelised preparation of garlic using controlled temperature and humidity to produce tarry black cloves with umami flavours of sweet molasses. There are no additives, extra ingredients or preservatives, just pure garlic. Guaranteed NO garlic breath! Synonyms: nothing quite matches it! Usage: You can roll your roast in black garlic powder or slice a black garlic clove across your omelette to release the luscious flavour. Cloves won gold medals at the 2017 Sydney Fine Food Awards and the 2016 Australian Food Awards and a silver medal at the 2015 Sydney Fine Food Awards. More here. "As executive chef for the International Convention Centre (ICC) Sydney, one of Australia's largest urban-based venues, you may think that I have little to do with regional communities. However, we have pioneered the development of a local supply chain by connecting directly with more than 87 farmers and local producers plus a directory of local winemakers. We aim to nourish not only our delegates, visitors and team members, but also the state economy." ​“Growing up my mother did not use much garlic in her cooking so I had no idea how terribly allergic I was until I was at my future mother in law's home for the first time. Being European everything was laced with garlic. I was consuming the lot not wanting to appear rude. That night I was violently ill, this condition lasted for two days. So sadly garlic was out of the question. 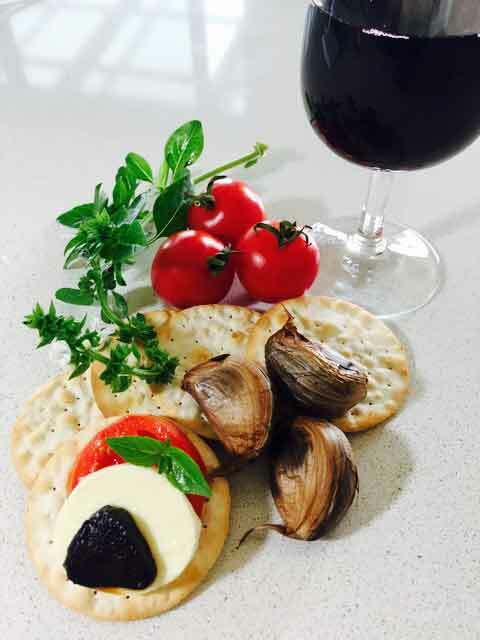 You can imagine my husband’s delight, being Austrian, to meet Jenny and Cathy at the Caravan Show in Sydney where we were introduced to Garlicious® Grown Australian Black Garlic. Still I wasn’t convinced and didn’t want to chance being ill again. We however did buy some product for Andy to try. Result …the food was wonderful and I had no reaction at all!